In Brazil was launched a book about the Beata, written by Sandra; I hope it quickly gets the bookstores. Has already been placed in the official website the information on the DVD of Mary's Dowry Productions. It will be launched in England in a church, on December 4. We hope to receive then a large report of the event. The campaign for the Beata on Facebook sums successes, with a membership that exceeds the highest expectations. 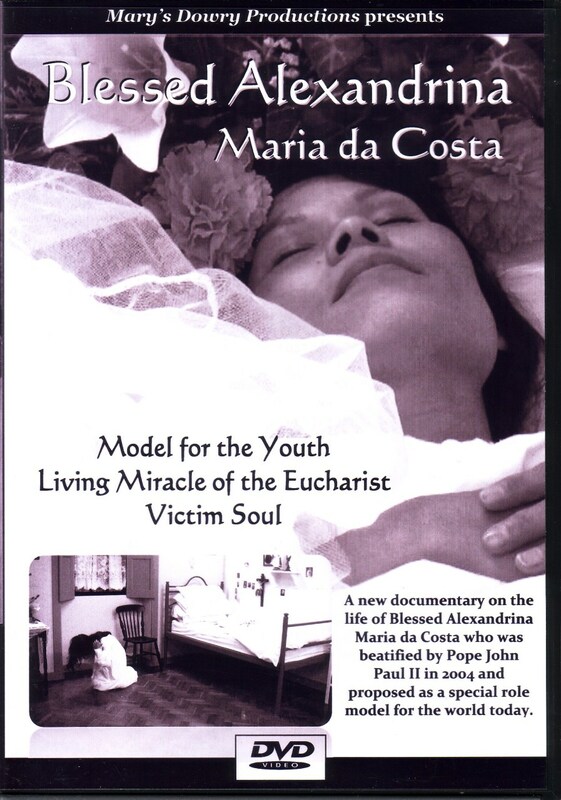 The first English language DVD on the life and mission of Blessed Alexandrina Maria da Costa, has just been released in England by the Catholic film company Mary's Dowry Productions. Two sisters, Bernadette and Emily Bevans, founded and run this company, and do almost everything themselves in the production and filming of the DVD's, even composing and playing the music for the soundtracks. Most of their DVD's to date have been about the lives of English saints and martyrs, but both sisters have had a devotion to Blessed Alexandrina of Portugal for some years, and so have been very pleased to make this film of her life and mission. The DVD continues the unique style that has been developed by the Bevans sisters, using actors and sets to portray the characters and scenes. The set designed by the sisters for this DVD is very much like Blessed Alexandrina's room. The action scenes are interspersed with photographs taken at Balasar, and the DVD has mostly been shot in black and white, with colour sequences at the end, which adds to the atmosphere, bringing to mind the many old black and white photos taken of Blessed Alexandrina in her home, and the video footage of her undergoing Christ's passion. The film also features shots of flowers and the beauty of the countryside - things which were very close to Blessed Alexandrina's heart. The narration is very clear in the DVD and the main events of the life and mission of Blessed Alexandrina are all covered. The DVD starts with a brief description of her birth and childhood, linking this with the Miraculous Holy Cross of Balasar, which appeared in 1832. Pictures of the Holy Cross and Blessed Alexandrina's home are skilfully interwoven with the acting scenes. The scene of the attack on Blessed Alexandrina and her companions is well executed and very moving. 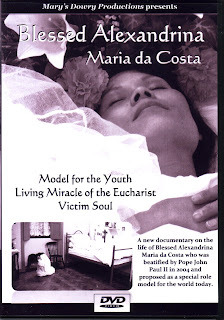 After the attack, the film then turns to the events of Blessed Alexandrina's life after her complete paralysis. A recurring theme of the DVD is Blessed Alexandrina's devotion to Jesus in the Holy Eucharist in all the tabernacles of the world, and her recognition that she had become a prisoner in her bed, just as Jesus has become a Divine Prisoner in the tabernacles for love of us. Instead of asking to be cured, she accepted Our Lord's invitation to become a 'victim soul', offering her sufferings to make reparation for the sins of mankind. The film mentions some of the appearances of Our Lord and Our Lady to Blessed Alexandrina, and also some of the attacks that Satan made on her. Blessed Alexandrina's connections to the events of Fatima come across very well in the film, which mentions Sister Lucia of Fatima's links with Alexandrina, and especially the pleas of Alexandrina to 'pray the Rosary, make the First Saturdays, and consecrate yourselves to the Immaculate Heart of Mary through the Brown Scapular' highlighting the Marian nature of Blessed Alexandrina's apostolate. The DVD also mentions Our Lord's request to Blessed Alexandrina to undergo His Passion every Friday in reparation for the sins of the world, so that the Pope would consecrate the world to the Immaculate Heart of Mary, an act which in turn would shorten World War II. The Passion scenes in the DVD are very reminiscent of the original footage of Blessed Alexandrina undergoing the Passion of Christ. The consecration was eventually accomplished through the prayers and sufferings of Blessed Alexandrina. Although the consecration was made, Blessed Alexandrina's mission certainly hadn't come to an end, as Our Lord told her that he wanted her to live on the Holy Eucharist alone - again highlighting the Christocentric and Eucharistic nature of these events. The acting scenes are often interspersed with pictures of various tabernacles, which help to bring this point home. The story of Alexandrina should be an impetus to the reception of Holy Communion and Eucharistic Adoration, and the DVD stresses this point. The film also highlights Alexandrina's connections with the Salesians and that she specifically prayed for young people. The horror of sin and the terrible suffering that Alexandrina underwent because of the sins of others is also brought home to us in this DVD. The film ends by showing the death of Alexandrina, and the Bevans sisters have lovingly recreated the famous photograph of Blessed Alexandrina after her death, surrounded by flowers and white gauze material. The final images of the DVD are some colour shots of Alexandrina's tomb and the parish church in Balasar, including a picture of the newly renovated tomb. This DVD is a much welcome resource to introduce others to the life and mission of Blessed Alexandrina. The Bevans sisters have done a great job and it should come as no surprise that they won the 2010 Catholic Women of the Year award, which was started 'to pay tribute to Catholic women who give outstanding service to the Church'. This is a well-deserved accolade for them and their work. Also further information can be found on the Mary's Dowry Productions blog. The Mary's Dowry Productions DVD on the Bld Alexandrina is already available. We hope to receive soon detailed information about it along with its price. The Bevans sisters have done a great job and it should come as no surprise that they won the 2010 Catholic Women of the Year award. Today, 16th October, was the 25th annual Rosary Crusade of Reparation in London, when well over 1,000 people processed through London, praying the Rosary, carrying the statue of Our Lady of Fatima from Westminster Cathedral to the London Oratory, where the day ended with hymns, prayers and Benediction. Kevin Rowles, author of 'Blessed Alexandrina - A Living Miracle of the Eucharist' and some helpers, gave out 500 leaflets on Blessed Alexandrina to people attending the Rosary Crusade. Also, the first-class relic of Blessed Alexandrina was taken to the Rosary Crusade, so that people could venerate the relic. See here many pictures of this year's Rosary Crusade and a comment. Come all, gather, they are celestial flowers! To you the world comes to gather flowers of virtues, flowers of love. In you is the divine wealth locked up. light and lighthouse of the world! the lighthouse that illuminates everything. lighthouse of which I am the lighthouse! just as I am The Lighthouse? I am so far from my Homeland! When will I be able to see you, Jesus? the day of my engagement? the more my heart longs to unite with Jesus. only Jesus can fulfil me. and the more souls there are to be saved. in my Jesus forever, forever? Alexandrina’s presence in the Church is making itself felt more and more. It is both a paradox and a challenge. Embodied in her, as in a transparency of Christ, is the bliss of suffering, the freedom of obedience, the joy pain, indeed Life in Death. Alexandrina is a humble, pure image of the Crucified and Risen Lord whom she loves. For the gift that she is for the Church, for the representation - in her flesh and her spirit – of the love that surrounds us all in the Paschal Mystery of Salvation, the young girl from Balasar is a presence and a "dangerous, but necessary memory". She personifies the evangelical paradox: the joy of the cross. But why? Because it is the joy of Love. We can say that Alexandrina is fully summed up these two words, paradox and challenge, words that spell out her inner life, express her mystical maturity. Because is coming the 13th of October, let us reflect a little about what were the last moments of the Blessed Alexandrina’s earthly life. Her friends say she didn't die at that day 13th October 1955, but that "she flew into Heaven." In fact this is what Jesus told her repeatedly. At 8 o’clock she received Holy Communion (her last). - Good bye, good bye until Heaven! Do not sin! The world is worth nothing! This says it all then. Receive Holy Communion often! Pray the Rosary every day! - Surely, tomorrow at the 3 o’clock (it would be Friday, the hour of the ecstasy), Jesus still wants to speak to you. She managed a faint smile. - I am very happy because I am going to Heaven! - In Heaven pray much for us. She indicated that she would. At 11:35am she asked for the prayers for the dying to be recited. At 7pm she was still saying: - I am going to Heaven! At 7:30pm she exclaimed: - I am going to Heaven! Deolinda replied: - But not yet! She answered: - It is, is! She had stayed perfectly lucid until the last instant.